Former French President Jacques Chirac has mocked his successor and party colleague Nicolas Sarkozy in memoirs covering his 12 years in office. He described his fellow UMP conservative as "irritable, rash, overconfident and allowing for no doubt, least of all regarding himself". He praised Socialist Francois Hollande, tipped as Mr Sarkozy's main rival if they stand in the 2012 election. Some analysts suggest Mr Chirac is taking revenge for perceived slights. Mr Sarkozy failed to support Mr Chirac during the 1995 election which put him in office and, following his re-election in 2002, made fun of the older man's love of Japan and sumo wrestling - a point raised in the memoirs. He won the 2007 election, in which Mr Chirac had to stand down because he had served two consecutive terms in office. Since his retirement, and despite a looming trial on corruption allegations dating back decades, Mr Chirac has enjoyed a popularity which often eluded him while president. An Ifop opinion poll last summer suggested he was France's most admired political figure, with Mr Sarkozy placed just 32nd. Volume II of Mr Chirac's memoirs is due to be published next week but extracts have appeared in the French press. 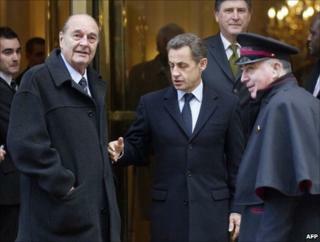 "Sarkozy - Chirac tells all" was the headline in news magazine Le Point. "We do not share the same vision of France, we do not agree on the basics," Mr Chirac writes in his book. After describing Mr Sarkozy as "one of the most gifted politicians of his generation", he frowns on his "inappropriate declarations", notably his call to "hose down" crime-ridden housing estates when he was interior minister in 2005. He suggests he once considered sacking him as a cabinet minister for insubordination but decided against it, in order to avoid a destructive confrontation. Another news magazine, Le Nouvel Observateur, homed in on the scorn Mr Chirac heaps on Mr Sarkozy's military service record, with the headline "Sarkozy, a special kind of squaddie". Mr Chirac, who fought as an officer in the Algerian War, sneers at the manner in which Mr Sarkozy set about his 12-month compulsory service as a young man in 1978. He describes him as a "military service skiver" because, Le Nouvel Observateur explains, he served in the air force in his home city Paris, in a capacity which allowed him to pursue his career as a municipal councillor and his studies as a law student at the same time. As for Francois Hollande, Mr Chirac describes him as a "true statesman" capable of crossing party lines. Critics say the memoirs gloss over Mr Chirac's own weaknesses, as well as alleged dirty tricks he and his supporters used in their unsuccessful bid to derail Mr Sarkozy's presidential candidature in 2007.